Ever realized that black sesame mochi is a party pleaser? Yes, we're just like Japanese people, very fond of mochi. This was the snack I brought to a family gathering on weekend. I’ve just got a packet of pure black sesame powder in my pantry. It’s good to make some aromatic, delicious mochi with it and share with my friends. Black sesame powder has the same health benefits as seeds, lowers cholesterol levels and enhances digestions as it contains high fiber content. Chinese people believe that black sesame powder also can prevent black hair from turning into grey too soon. For myself, I like the aroma of black sesame seeds and powder. It can’t be easier to make this mochi snack. 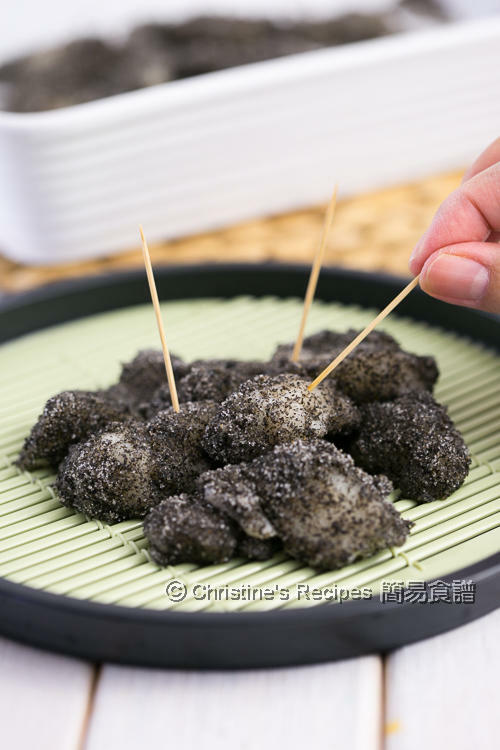 You can quickly cook the mochi dough in a microwave oven, then get it coated with some black sesame powder. There you go. This snack was a big hit in our gathering. Its aroma, chewy texture and taste are the attractiveness. 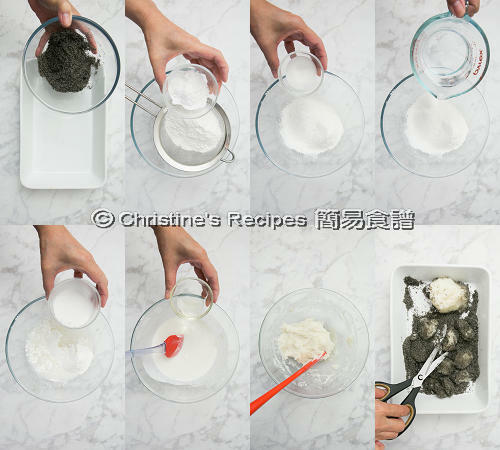 To make coating: In a mixing bowl, mix black sesame powder and sugar very well. Set aside. Sift glutinous rice flour and tapioca flour into a large glass container or a microwave safe bowl. Add sugar, salt, water, coconut milk and oil. Mix well. Cook in a microwave oven on high (I used power level 8, 1100W) for 2 minutes. Carefully remove the bowl from microwave oven. Use a spatula to knead the mixture for a few times. Put the bowl into the microwave oven again. Cook on medium-high (power level 6) for 1 minute. Knead with spatula into a dough. Let cool. Transfer into the bowl of black sesame powder and sugar mixture. Cut the dough with a pair of scissors into small-bite-sized portions, evenly coated with the coating mixture. Enjoy! When the mochi is still hot, don’t mix with the coating. Otherwise the sugar will be melted. If you don’t mind the presentation, then consume it when hot. It’s not too bad after all. The taste is still good. The voltage of my microwave oven is 100W. Please adjust the cooking time and level of power accordingly if yours is different. Pure black sesame powder is available at Asian grocers. Here's a brand of pure black sesame powder on Amazon I used before. I love that you used coconut milk in mochi dough. 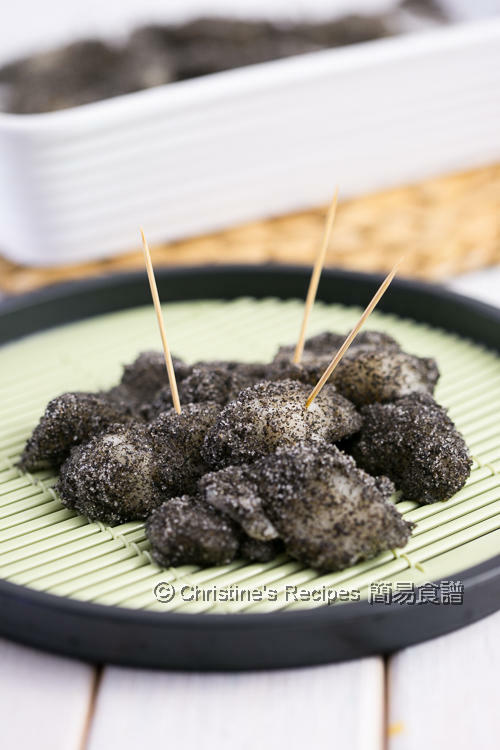 They look very delicious with black sesame powder. Would be nice with peanuts too. Great minds think alike, Angie. We all love the aroma of coconut milk. Peanuts are wonderful. Your mochi looks very soft and delicious. Could I use the stove or oven to cook the dough instead of the microwave oven? Thanks. You can steam it in a wok using a shallow dish. Hi Christine, this looks delicious. But how do I make this if I don't have a microwave oven? If you don't have a microwave oven, you can steam it in a wok. Remember to use a shaollow dish. Otherwise it takes very ong to get it cooked. HiChristine, how many minutesdo i need to steam the dough? It depends on the size, how deep and large your utensil for steaming. Normally it takes 20 to 30 minutes if using shallow dish. Hi Christine, what type of glutinous rice flour do you use (cooked/raw)? And what's the difference between them? The glutinous rice flour is supposed to be cooked in a microwave oven. Raw glutinous rice flour is good to go. No need to buy the cooked one.